L'oreal Precious Oils come in two varieties to complement their already existing hair care lines, Nutri-Sleek and Colour Radiance. I've personally been using the Colour Radiance oil since late September and could not be happier. They come in gorgeous glass bottles (seriously thick glass, it look really nice) that hold 100 ml of product, the best part is they retail for about $9.99 (I've seen them on sale for as little as $6.49). I'm not going to lie, when I first saw the glass bottles and the size of the product I really thought they must have mis-priced it, there was no way something that big and nicely packaged was going to cost me that little. So as I said I've been using the Colour Radiance Oils for some months now and I cannot tell you how in love I am with it, but I am going to try. This product made me throw out my Moroccan Oil! No lie, I no longer use Moroccan Oil at all. I've moved on to this lighter and more useful oil (at about a 1/3 of the price). 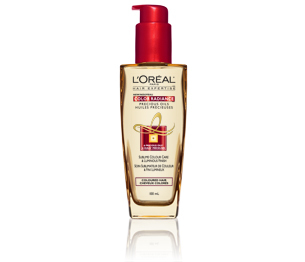 I love that it can be used pre washing my hair as an oil treatment to protect my hair. I adore that I can use it on dry hair and feel like it isn't going to weigh it down. I use it wet after every washing of my hair, but to use it in the mornings on dry hair is amazing benefit too. I love the pump, I feel I am never going to overdose my hair again (or waist a lot of expensive product). Did I mention it is cheap! At $9.99 I can afford to use this stuff everyday over and over again and load my hair up before washing it. Ok so I think those are good enough reasons to try it out, at the very least it isn't much of an investment. Personally, I just love it and I am so glad there is a mainstream hair oil that is made for colour treated hair and is at an affordable price point. Find out more about L'oreal's Precious Oils by checking out their web site and watching this video (pissst they are giving away bottles on their site right now).